This mind map, created by Learning Fundamentals, was inspired by Leo Babauta’s eBook “Focus: A simplicity manifesto in the age of distraction”. We shared it yesterday on our Tumblr and Facebook page and from the response we got we figured we are not the only ones struggling to balance social media addiction, work and the (usually) flooded inbox. 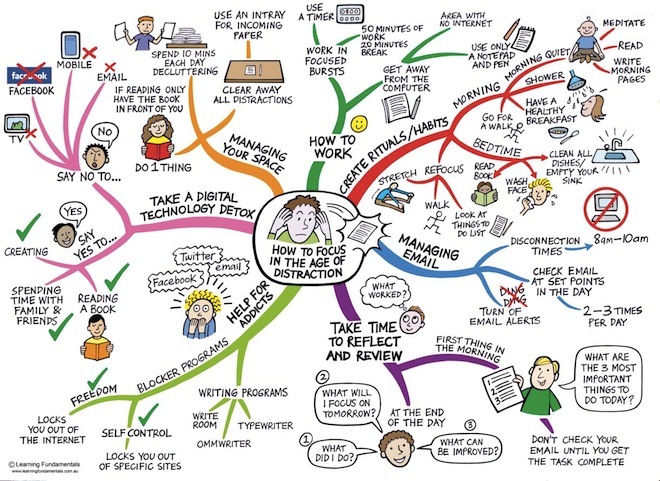 How do you manage to stay focused in the age of distraction? Share in the comments bellow.